Safe in the Street will not teach you how to fight. It will show you how to prevent an attack by being aware of the danger signs that precede one. Learn the three stages of an impending assault and the right reaction to each. 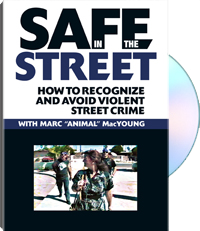 Plus, learn with Safe in the Street how your attitudes and actions warn thugs that you are not a "safe" victim and attacking you is not worth the risk.